TU SEI UN PROGETTO POSTURALE. SEI PRONTO? / YOU ARE A POSTURE PROJECT. ARE YOU READY? Tu sei un progetto posturale. Sei pronto? – Ma pronto a cosa? La mente non è sempre pronta a tutto, ma il corpo sí! Per questo ognuno di noi ha un progetto con il proprio corpo, che vale per tutta la vita. 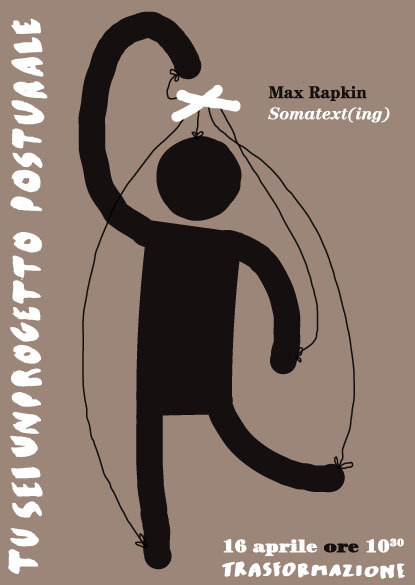 Max Rapkin, chiroprata, aiuta le persone a prendere consapevolezza del proprio corpo e a trovare un equilibrio fra i diversi muscoli che lo compongono. Attraverso alcuni esercizi introdotti da Max, le persone scoprono che il loro corpo reagisce velocemente al semplice tocco della mano su alcuni punti o all’assunzione immediata di una determinata posizione di un muscolo. “Il corpo parla e, a differenza della parola, non inganna mai. Bisogna sapere ascoltarlo e scoprire i mezzi che usa per comunicare con noi e rispondere ai messaggi che riceviamo da lui”. “Somatext(ing)” considera il corpo come un testo. È un modo di far parlare il corpo affinché possa riequilibrarsi. È una tecnica di lettura e scrittura: il corpo chiede di essere letto come un testo da un occhio esperto che riesca a visualizzare i codici errati. Una volta compreso il testo somatico, si può iniziare a “riscrivere” la nostra postura e a riequilibrare il corpo per andare verso un modo più vero di vivere il lato posturale di noi stessi, quello che più di altre parti sostiene e ci permette di affrontare le novità della nostra vita. Nato a New York City (USA), laureato in Chiropratica (1991) al Life College, Altanta; in Storia (1980) all’Università di Stanford di Palo Alto California; successivamente specializzato presso la Prague School of Manual Medicine. La sua ricerca medica è diretta allo studio della postura, utilizzando i contributi sviluppati in neurologia, gli studi in campo di bioenergia e di kinesiologia applicata. – You are a postural method. Are you ready? – But ready for what? Our mind is not always ready for everything, but our body is always ready! This is why everyone of us has a project with his/her own body, that is for all of his/her life. Max Rapkin, chiropractor, helps people to become aware of their own body and to find a balance among the different muscles that compose it. 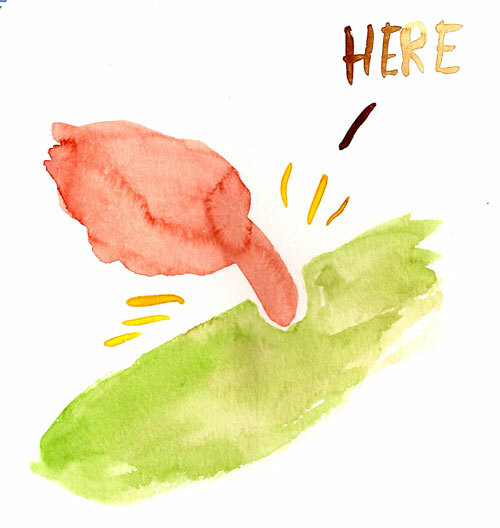 Thanks to some exercises introduced by Max, people find out that their body reacts very quickly to a simple touch in a specific zone of their body or to a certain position of one muscle. “The body talks and it never lies. We have to listen to it, discover the means that it uses to comunicate to us and find out how to respond to the messages that we receive from it”. 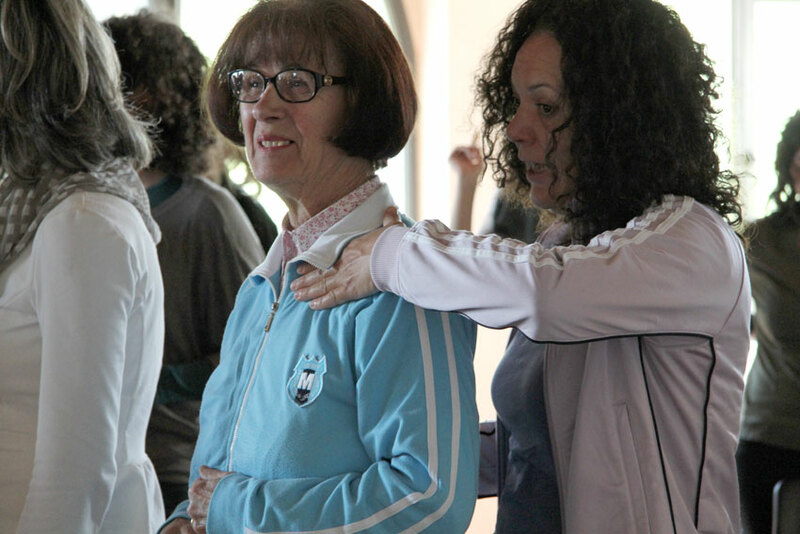 The workshop goes on…the afternoon hosts new approaches from chiropractic, health massages, dance. The first speech of the afternoon is held by Max Rapkin, chiropractic, who presents the methodology that he usually applies with his patients. The basis of his work concerns re-lecture and re-writing of postures, basically applied through 3 perspectives: the concept of soma, the consideration of a surface between the patient and the osteopath and the proper postural part. After a theoretical explanation, Max gives a demonstration of his method with a muscle test that involves all of the participants, offering them the opportunity to share and to experiment this practice. 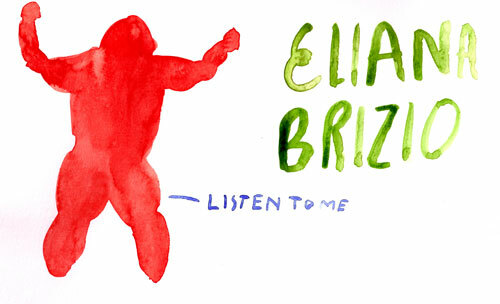 Another method proposed today is the Grindberg’s one, presented by Eliana Brizio, who explains how It is possible to learn from physical symtomps, also offering a touch session for people who need to get in contact with their body and relax theirselves. The last experiential activity of the day is a dance and movement experience, that enhables people to express theirselves and to comunicate with the space and the others. 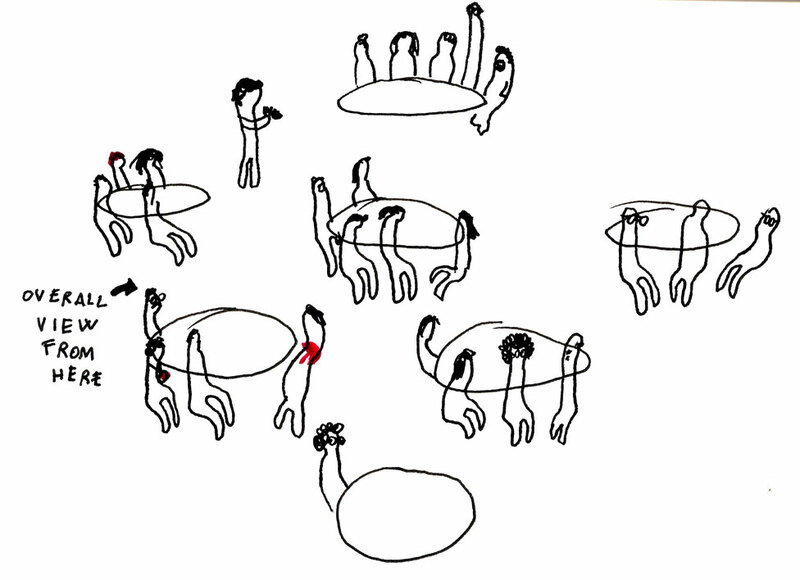 “Coincidencies that lead to similarities” are the keywords expressing this project: the coreographer invites people to draw a map of movements around the space, where they have to identify some dots and refer them to special moments in their life. When people find theirselves in the same dots, they feel as they were sharing the same moments of life. The brainstormig session closes the activities of today, presenting as issue of discussion “The natural and spontaneous aspect of transformation. The individual”. 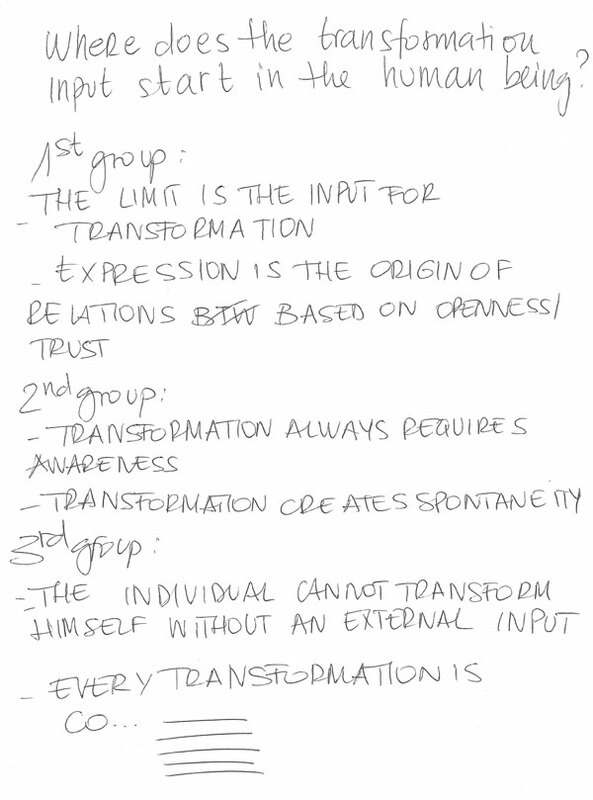 The participants, divided in three groups, has to answer to the following key question: “where does the transformation input start in the human being?”. The answers collected will be points of further discussion. “Foot analysis and touch session” (held by Eliana Brizio), “Atelier of dream telling” (by Emilio Fantin), “Cooking lessons of bread making” (by Rosanna D’Ambrosio) are the additional off time activities of the day, which give participants the opportunity to participate in a spontaneous and free way. Dinner – SUD SUD SUD! the tradition of Southern Italy, simple food from a humble land: bread products – “pucce” (small breads with olives and vegetables) to be eaten with tomatoes, rocket and tuna, “pittule e cottu” (small fried bread balls with vine molasses), dried tomato soup, “pitta de mennule” (almond cake). Sweet bread for the breakfast of 21st. Bread making with “pasta madre” during the afternoon, open to participants – the original technique of leavening, the transformation of flour into bread and more. 30 people 5 languages: a cellular organism. living, moving, experimenting, feeling physically the space Cittadellarte, spontaneously taking fun with languages mistakes,. Researching new activities connections, between individuals, skills, fields with creativity at the centre of responsible social transformation. Tow groups (expert participants and coordination-editorial unit) and one common goal: develop and spread knowledge on methods of transformation. One first “active tool”: “the External Observer” help the work of the group. External Observer has been experimented in artway of thinking research methodology for the governance of collective creative processes toward common good. In the workshop Herman has the role of the observer. He will observe the applied methodology within the works, and will offer live feedbacks to coordinators in real time, to better follow the best path . 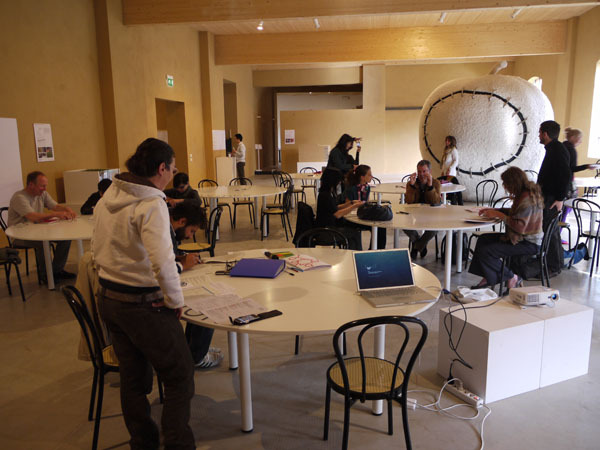 artway of thinking and lovedifference open the doors of Cittadellarte-Fondazione Pistoletto to the participants of the Workshop “Methods 5. 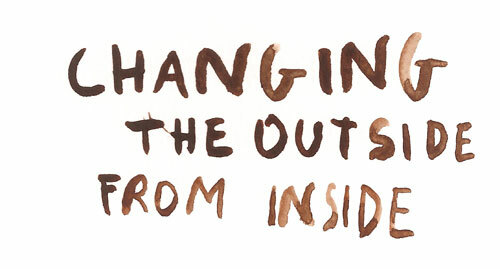 Processes of Change”. 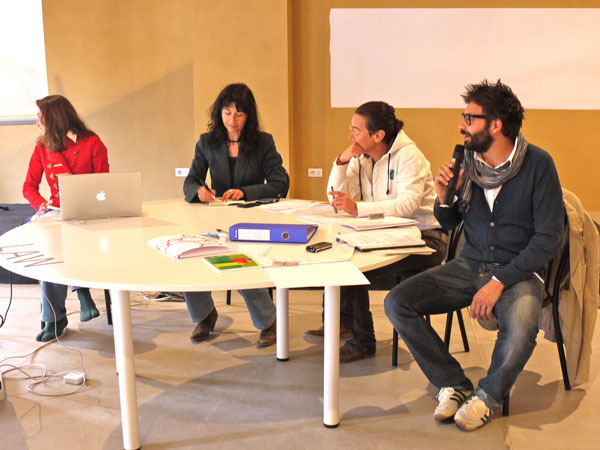 The fifth edition of the workshop about methodologies in social art extends its field to other disciplines beyond the artistic context, inviting International guests to share and conceive new ways of developing methodologies in processes for social change . The fifth edition of Methods. Processes of Change starts today. This morning, Love Difference and artway of thinking welcomed the 33 International participants, presenting the main concept and the schedule of the 5 days of the workshop. The new edition of Methods presents a new intracultural and multidisciplinary perspective of sharing information among representatives from different fields ( art, psychology, alternative medicine, dance, architecture, spirituality, music, cuisine, economics, anthropology, education…), in order to develop a work in progress through processes of sharing. “What is going to happen in these days, will be created during the process”: this is the statement that Federica Thiene of artway of thinking expressed today as the semantic guide of the project. The organisers of the workshop stressed the importance of dividing the participants into two main groups: the first consists on the participation of experts, who wil present their contribution to define a methodology in their field of work, and the second one is composed by the editorial unit, that will give an essential contribution to the organisation and the communication of contents. All the fluxus of information that will be produced and shared during these days will be collected, organised and spread by a miscellaneous team, who will try to recreate the actions and the feelings of the process, through different media (video, photo, graphics, text). 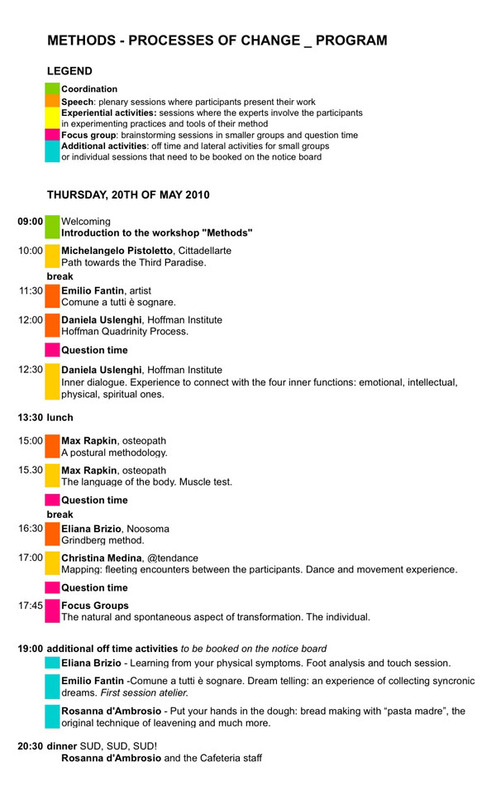 The participation will be virtually extended to the public outside the physical setting of the workshop, through the blog (https://methodsprocessesofchange.wordpress.com) and the Facebook profile (Methods / Processes of Change _ research project on art-society relations). 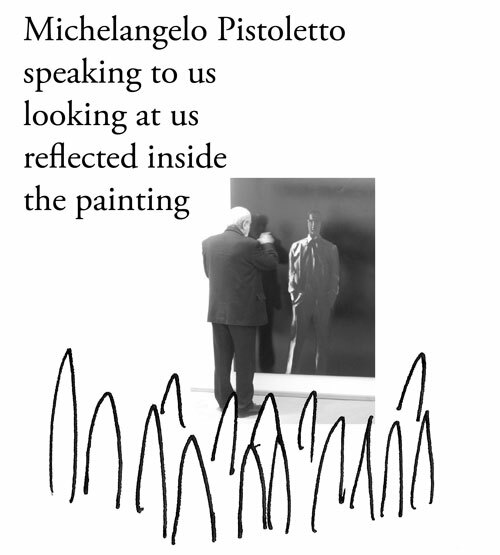 The presentation of the workshop was followed by Michelangelo Pistoletto’s speech, who introduced Cittadellarte to the participants in a very introspective way. Pistoletto expressed the concept of the workshop Methods, referring to the inner essence of Cittadellarte, as consequence of the research started in the 60s with the “quadri specchianti”. The desire and the needs of extending the search of identity to the environment, explained Pistoletto, represents the basis of the creation of his infinte production of mirrored artworks, as well as Cittadellarte (as lab of communication and relation between art and different disciplines) and finally Methods, as expression of the progressive evolution of the relational processes between art and society. 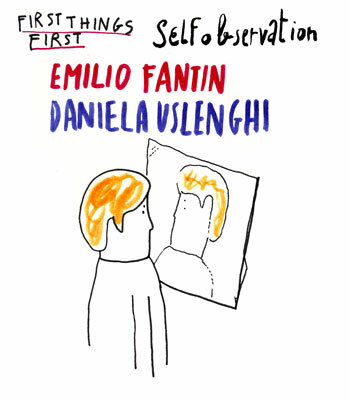 The morning continued with the artist Emilio Fantin, who explained his approach in his research of connections between dreams and daily life, starting from Jung’s psychoanalisis and translating it into an empiric method. 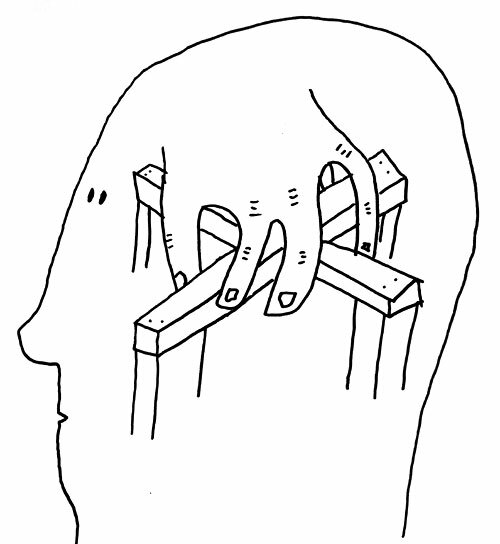 The following contribution was Daniela Uslenghi’s speech, where the psychologyst invited the public to enter directly the Hoffman approach, involving them in an experiential activity which gave them the opportunity to stop themselves for a while, close their eyes and think about their emotions, body and actions in a very delicate and natural way. The first speech of the afternoon is held by Max Rapkin, chiropractor, who presents the methodology that he usually applies with his patients. The basis of his work concerns re-lecture and re-writing of postures, basically applied through 3 perspectives: the concept of soma, the consideration of a surface between the patient and the osteopath and the proper postural part. After a theoretical explanation, Max gives a demonstration of his method with a muscle test that involves all of the participants, offering them the opportunity to share and to experiment this practice. Another method proposed today is the Grindberg’s one, presented by Eliana Brizio, who explains how it is possible to learn from physical symtomps, also offering a touch session for people who need to get in contact with their body and relax themselves. The last experiential activity of the day is a dance and movement experience, that enhables people to communicate with the space and the others. “Coincidencies that lead to similarities” are the keywords expressing this project: the coreographer invites people to draw a map of movements around the space, where they have to identify some dots and refer them to special moments in their life. When people find themselvesin the same dots, they feel as they were sharing the same moments of life. The brainstormig session closes the activities of today, presenting as issue of discussion “The natural and spontaneous aspect of transformation. The human being”. The participants, divided in three groups, have to answer to the following key question: “where does the transformation input start in the human being?”. The answers collected will be points of further discussion. Foot analysis and touch session, Atelier of dream telling, cooking lessons of bread making are the additional off time activities of the day, which give participants the opprtunity to participate in a spontaneous and free way. Christina: It’s not a problem. You can do it now.